She has that adorable under bite which sets off those gorgeous eyes naturally outlined by God. We already had 2 dogs, both lived in the yard. We wanted a house dog too. She was a tiny little puppy, frightened and crying as we shopped for puppy supplies trying to keep her corralled in the shopping cart. It was adoption day at Pet Smart. We planned to be there and we were much more excited than she was. 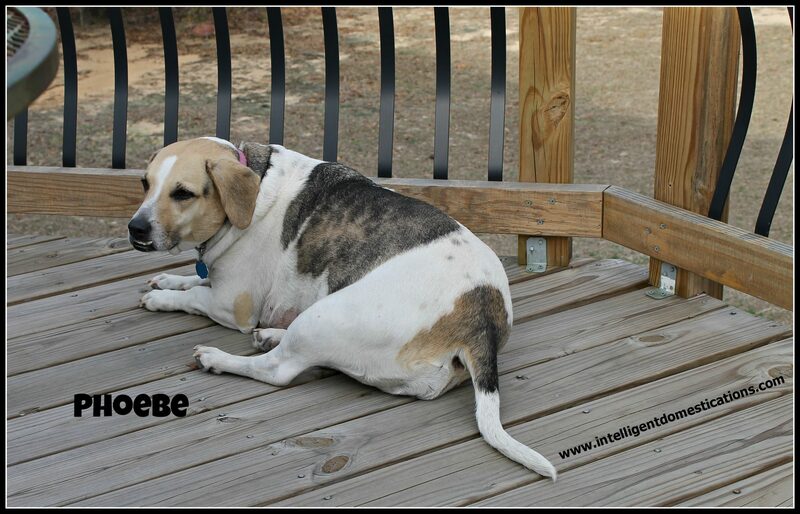 She is a beagle, basset mix with beautiful coloring. The black fur on her back forms the shape of a heart. The very day we brought her home, we found our dog Rhett dead just outside of the fence. We have just under 3 acres of wooded property in rural Georgia. We had chain link fencing installed to keep our dogs in an area we determined to be the front and back yards closest to the house. Of course dogs will dig and those 2 boys had dug out from under the fence to go exploring in the woods. We patched the holes and they would dig somewhere else. It was a battle to keep them in the yard. They loved exploring the woods. We had no idea of what that day would hold. We wanted to introduce Phoebe to the boys, Rhett and Orbit. When Rhett didn’t come, my husband went looking for him. He had been shot and died just outside of the place under the fence where he had crawled through. My husband buried him right there. Orbit went out that hole and literally laid on top of Rhett’s grave every day for some time. Yes, animals grieve too. When Rhett didn’t come, my husband went looking for him. Somehow, Orbit must have associated Phoebe’s arrival with Rhett’s departure because he refused to even look at Phoebe for a very long time. Orbit lived in the yard alone and Phoebe lived in the house. We put a lot of effort into house training Phoebe but she had no intention of being house trained. She wanted to be in the yard with Orbit. She had purposed in her heart that he was going to play with her. After some months, Orbit finally caved in and warmed up to his new friend. That was about 8 years ago now. We call them husband and wife. Anytime Orbit ever wondered off for more than an hour, Phoebe would sit in one spot and bark until he came home. She didn’t tolerate him running around! He eventually gave up on wondering through the woods and quit re-digging the holes we patched. They are both older now and don’t care so much about what happens outside of the fence. Don’t let a squirrel come through INSIDE the fence though! Surgery was scheduled for seven days later. We had a choice of paying for pathology or not. We also had a choice of paying for a full blood work up or not. We paid for both. On the day of her surgery, she had to be there early. I expected to leave her with the tech which is exactly what happened. I was told to call and check on her around 3pm to see if she could be released. The surgery went well and Phoebe was free to go home after 3pm. I drove the 12 miles to the Vet office and picked her up. I fully expected the Vet to come out and speak to me about the surgery. That did not happen. The tech gave me instructions on bandage care and a follow-up appointment. The tech did tell me that they removed a tumor about the size of an orange. The tech said we would have to wait on the pathology to come back for more information. I accepted that, although I wished I could have spoken directly to the Vet. I had questions and wasn’t even sure what they all were. 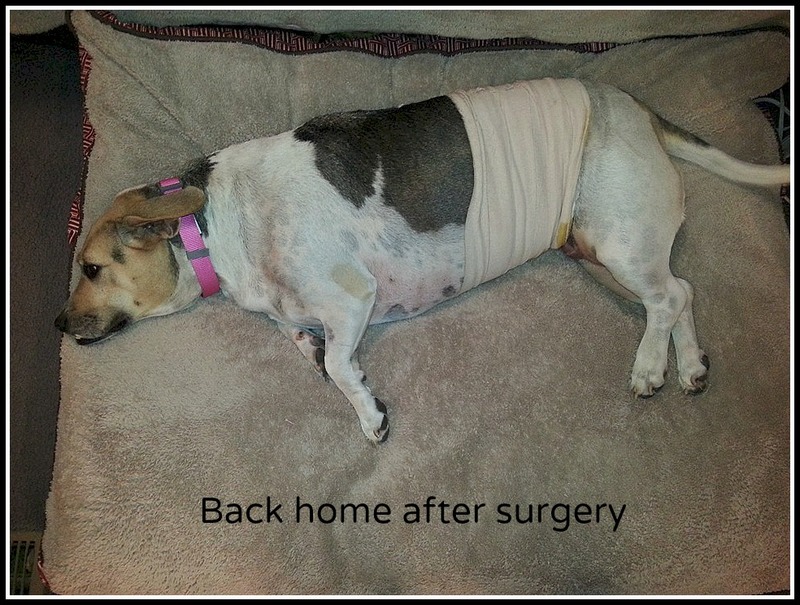 Phoebe had a bandage around her belly to cover her incision. She was a very good girl about it. At no point in time did she try to get the bandage off. She was obviously sick from the surgery but we took excellent care of her. She had become an inside dog again. We purchased her a nice big fluffy memory foam bed to lie on in the den. When we went to bed at night, we carried her new bed into our room and placed it right next to our bed. She learned to sleep next to her Daddy which she expects and loves. She recuperated nicely from the surgery and all was well with the world. She finished all the meds and was up and playing again. Two months later, another sore appeared on her belly. We made her a vet appointment immediately. Let me just say this. I had mentioned to my husband that I didn’t really like not going into the exam room with Phoebe. Maybe they just do things differently at our Vet office but I’m not too crazy about it. I would also prefer to speak directly with the Vet and not have to go through a tech for everything. Fortunately for me, on this visit I got both of those desires. The vet and her tech assistant came into the exam room that Phoebe and I were waiting in. Phoebe is a big girl, she weighs in at 65 lbs. The Vet chose to examine her on the floor rather than lift her up to the exam table. We were there because of the new sore but the vet showed me a stitch from her surgery that needed to be removed. I had not seen that at all. She said the stitch should have dissolved but was instead pushing itself out. She left and came back with what seemed to be surgical scissors and promptly begin to cut and dig. I cringed. Poor Phoebe. She was bleeding. Phoebe was trembling all over but never made a sound. The vet didn’t deaden the area in any way. Of course it hurt but she never even whimpered. I made a statement to the Vet at that point about the pain I believed Phoebe was experiencing. She told me that if Phoebe was in pain, she would say so. Hmmm. I made a decision right then. The vet prescribed a topical cream to put onto the sore which we now know is actually a tumor. She told me that if that cream doesn’t dry it up, she would need surgery again. I took my sweet Phoebe home. She was so sore I had to help her out of the car. After she laid down on her bed, she did not get up again until time to go sleep beside our bed that night. Of course the vet hurt her. I was so hurt for her. We had gotten Phoebe a second bed which had become her bedside favorite. She has to lift her legs ever so slightly to get in because it has sides but she just loves it. She likes to do what we call ‘hunker down’ and stick her nose into the soft corner. It was all she could do to get into her favorite little bed that night. Again, we nursed her and loved on her. I took her to my daughter’s vet. It’s a good 30 minute drive away in the next town but I sure didn’t mind. He was awesome! Phoebe and I were escorted into the exam room with not one but 2 tech’s. They knew she had cancer, my husband explained everything when he made the appointment. I love this. Vet. Dr. G. shook my hand when he introduced himself. He put Phoebe up on the table, all 65 lbs. of her and examined her carefully. She was a sweet girl as always, never flinches, barks or growls. Dr. G talked to me about the exam as he was doing it. He showed me where her lymph system was abnormal between his fingers which meant the cancer is probably there. He paid special attention to the tumor. I had to explain to him that the extra hole in Phoebe’s belly was dug there by the awful vet. Dr. G. talked to me about x-rays and an ultra sound. I agreed to do both. 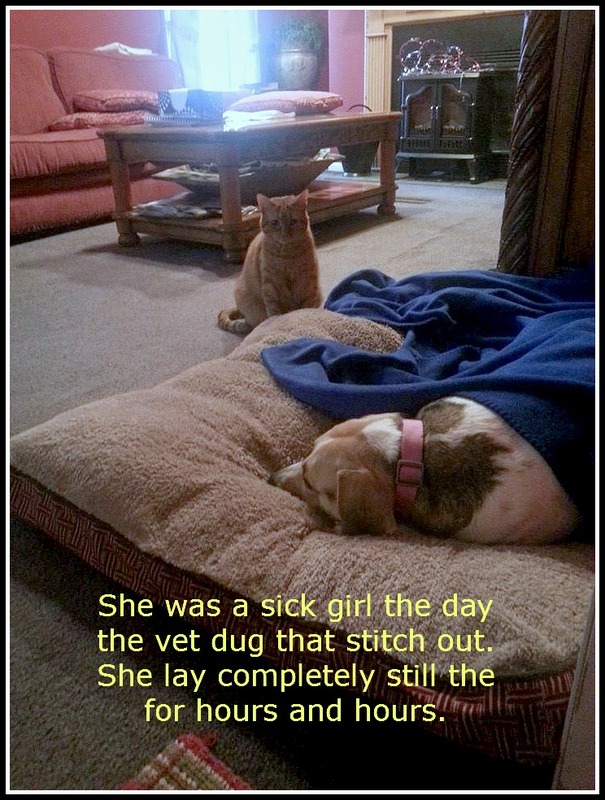 He asked me to wait while he phoned her former vet office to get the details of the biopsy. The x-ray showed that her spleen is enlarged. The biopsy was malignant. He shared our options with me. In his best guess, he said maybe a couple of months. I swallowed the lump in my throat and tried my best not to cry. I had texted my husband during this long office visit and asked him to please leave work and come there. I realized it was worse than we had thought. We had previously been told that Phoebe would need another surgery to remove this new tumor. We both thought we needed to know more about why another tumor had surfaced. My husband pulled into the parking lot just as Phoebe and I were exiting the building. She recognized her Daddy and begin to wag her whole body in excitement. I told my husband everything over lunch. A couple of months can go by very quickly in the fast pace of life. 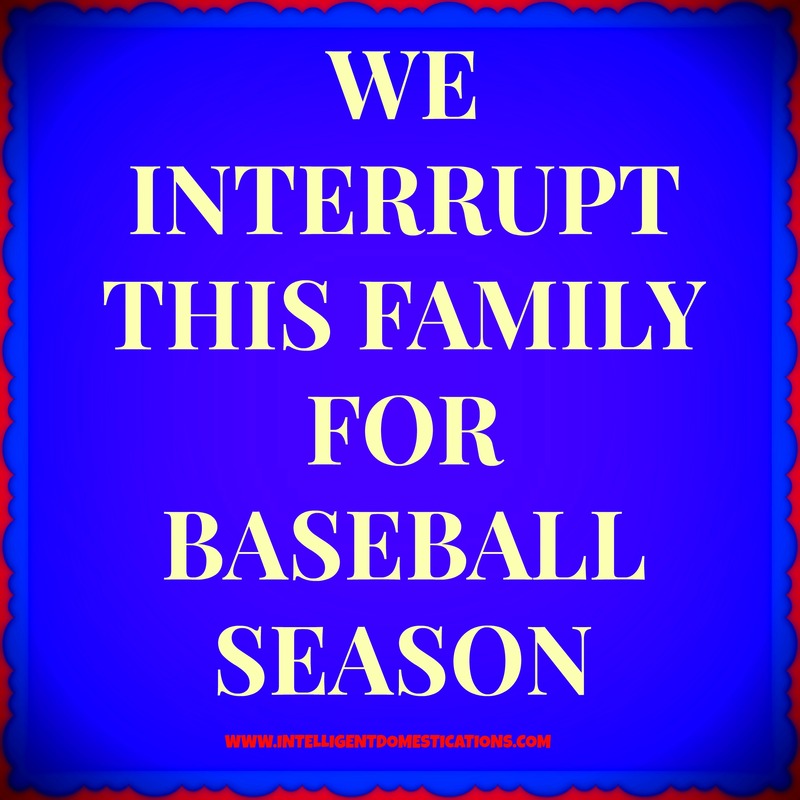 We are empty nesters. Phoebe has our full attention. She isn’t eating as much as she normally would but she is still eating. She sleeps a lot and steps over the threshold very carefully when lifting her back legs. She follows us around the house so she can lay at our feet when she isn’t on one of her cushy beds. She actually barked at the UPS man the other day, it was really cool! 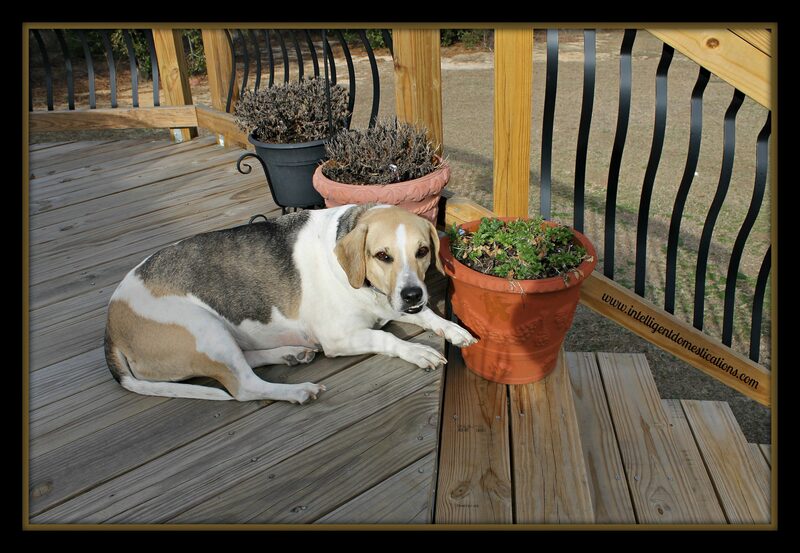 Phoebe sitting on the deck with us last Sunday afternoon. 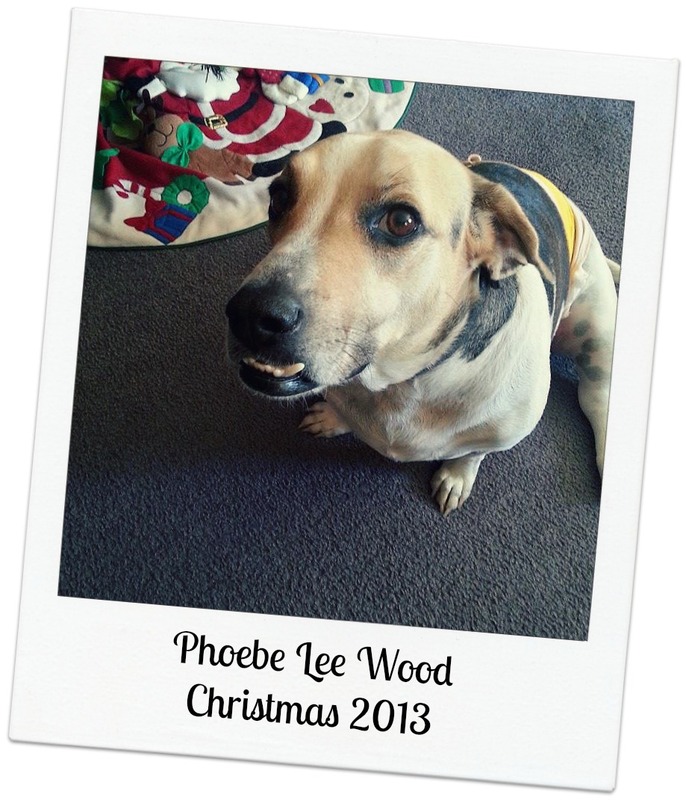 Phoebe has squamous cell carcinoma. I will tell you more about her personal experience with the disease including the medications she has been prescribed and her reactions to those. Please come back here Monday March 3 for that story. This blog uses affiliate links for financial support. By clicking on an advertisement, you will be helping to keep this blog alive financially. Thank you. Your dog looks so much like my Missy, it’s been difficult for me to read, because I see her face there. She’s a beagle/black lab mix. My heart and prayers go out to you. Thank you for telling her story. Thanks for linking up with Wake Up Wednesdays! Come back next week to see if you’re featured. It is our hope that by talking about it, we can bring awareness to canine cancer. Phoebe has skin cancer. Many people are not aware that dogs can get skin cancer. We did not know. Thank you for stopping by Christie. My heart breaks reading this story. My two dogs are like my other children and I can imagine how you feel. I hope you get more quality time with her. She’s lucky to have owners that take such good care of her. Thank you for those kind words Amanda. we have 3 dogs and 2 cats, they are all our babies. She is really being smothered with love by all of our family right now. A agree, a lucky dog to have such a loving family! So hard to see all the cancer going around and attacking even our pat friends. We live in a fallen world, looking forward to redemption, where there will be no pain, no tears, no death. Oh, Shirley. I read this with tears in my eyes. We have a cat and a dog, and I can’t imagine having to go through this. You are doing such a good job. I know Phoebe loves you for it! Thank you Kristen. She is so sweet and has been just precious while living indoors with us. We really wish she had been inside all these years but it wasn’t to be. She loves being loved on and she gets a lot of that. What a sweet little girl – Bless her heart. She’s endoured a lot – What a lucky dog to have such a loving family! Thank you Renee. She is such a sweet dog and has been ideal while living indoors with us. I am so sorry for your poor dog! I it hard to see our loved ones go through pain and trials! Thank you for those kind words Amber and thanks for stopping by. I hung on to your every word as you told the story of your beloved Phoebe. My heart goes out to her and to you and your husband. She’s blessed to have you and I can tell that she has brought much joy into your life. Thank you Alli. God will get us through it. He is so good to comfort us and give us wisdom when we need it most.